This is a post I started back in May before my trip to Colorado and Santa Fe. I had planned to finish it when I got back, but was distracted and put it aside. Now I must finish it. Unfortunately, it no longer has the happy ending it originally had. 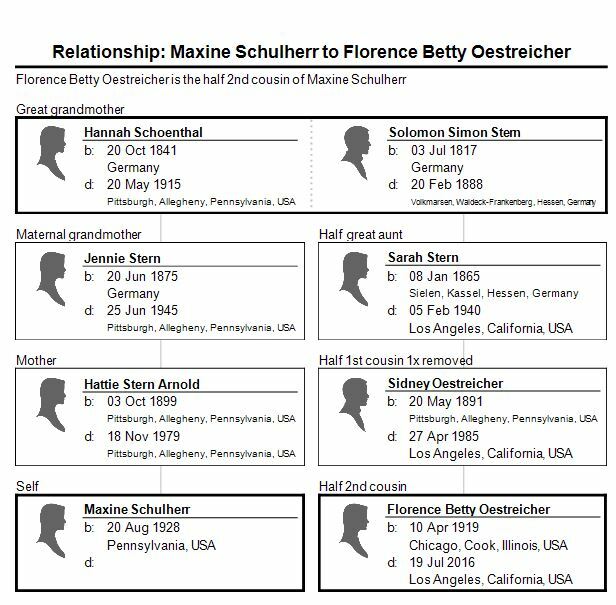 As I wrote a few months ago, my newly found third cousin Maxine Schulherr Stein, the great-granddaughter of Hannah Schoenthal Stern (my great-grandfather Isidor Schoenthal’s sister), had lost touch with her second cousins Betty and Elaine, also great-granddaughters of Hannah Schoenthal Stern. Betty and Elaine’s grandmother Sarah Stern and her husband Gustav Oestreicher had had three children: Sidney, born in 1891; Francis (known as Frank), born in 1893; and Helen, born in 1895. They’d all lived in the Pittsburgh area at first, but as Sarah and Gustav’s children became adults, they’d eventually left the Pittsburgh area. Helen had moved to California by 1935 where she and her husband Aaron Siegel and their daughter Betty lived in Los Angeles. Frank also was living in Los Angeles by 1942. It was Sidney Oestreicher and his family whom Maxine knew best. She knew that Sidney was married to Esther Siff, and they had had three children: Gerald, Florence Betty (known as Betty), and Elaine. But Sidney Oestreicher also had left the Pittsburgh area when he moved to New York in the 1940s. The family had left their youngest child Elaine behind with Maxine’s family so that she could finish the school year in Pittsburgh, according to Maxine. By the 1950s, all of the members of Sidney Oestreicher’s family had moved to California to be closer to the other members of the family. Given the distance and the limited modes of communication back then, the family members back in Pittsburgh eventually lost touch with the California branch of the family. When I spoke with Maxine, she asked me to help her locate the cousins she’d known as a child. I knew from my own research that Gerald Oestreicher (who, like his father Sidney and his uncle Frank, changed his surname to Striker) had married Faye Krakower and had had two children. Gerald died in 2014 and Faye in 2015. But finding Gerald’s sisters Betty and Elaine had proven to be more difficult, as is generally the case with women. Fortunately, I found one very important clue that helped me find both Betty and Elaine for Maxine (and for me). I thus knew that Betty had married a man named Julius H. Jacob. And from various other records for Julius, I knew that they had lived in the NYC area for some time and that they, like the other Oestreichers/Strikers, had eventually moved to California. But I had not been able to find their current residence. 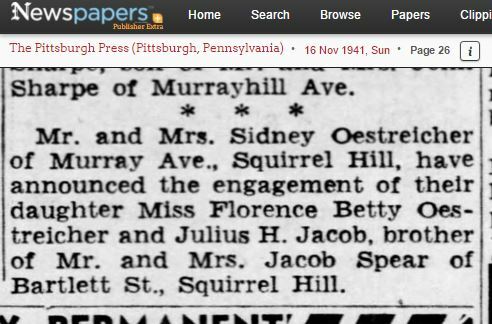 Newly motivated by Maxine’s request, I looked again at the engagement announcement and saw that Julius was described as the brother of Mr. and Mrs. Jacob Spear. Who was that? I inferred that Julius was the brother of Mrs. Spear, not Mr. Spear, given the different surnames, and decided to see what I could find about the Spears. I found Jacob Spear and his wife Else (presumably born with the surname Jacob) on the 1940 census, but more importantly, I found them both on several family trees on Ancestry. Although I am generally skeptical of Ancestry trees, one of those trees belonged to a genealogy researcher whose work I trust: Jennifer Spier-Stern. I contacted Jennifer, and after we exchanged more information and verified the connection between Julius Jacob and Elsie Jacob, Jennifer was able to put me in touch with the son of Jacob Spear and Else Jacob, John. John is the nephew therefore of Julius Jacob, husband of my cousin Betty Oestreicher. Not only did John know the whereabouts of his aunt Betty—he had contact information for her son Ron. And he pointed out that the upcoming weekend would be her 97th birthday. Now that gave me the chills! I emailed Ron, and we exchanged several emails. And Ron gave me the phone numbers for both his mother Betty and his aunt Elaine, who is also still living in California. In May I had the great pleasure of speaking to two more of my third cousins, Betty Oestreicher Jacob and Elaine Oestreicher Wallace. The following information came from a combination of my conversations with Betty and Elaine and the emails and conversations I had with my cousin Ron. Betty was remarkably lucid for a 97 year old woman, and she was delighted to answer my questions and reminisce about her family and her life. Elaine also was warm and excited to share her stories with me. 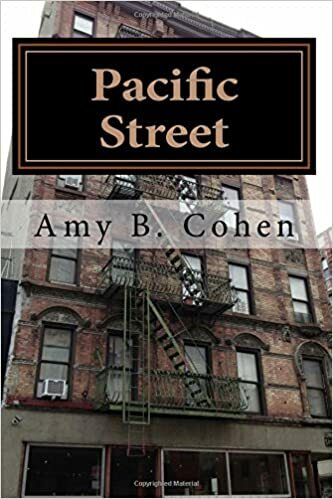 I had hoped that one of them would have stories about their grandmother, Sarah Stern, who was the first child of Hannah Schoenthal and who had come without her family to the US when she was nineteen years old. Unfortunately, as was so often the case, both Betty and Elaine said that their grandmother Sarah did not speak about her childhood or about the move to the United States. I did learn, however, from Betty that Sarah met her future husband, Gustav Oestreicher, when he was staying at the boarding house in Pittsburgh run by her mother, Hannah Schoenthal, my great-grandfather’s oldest sibling. Betty also told me that her grandmother Sarah suffered from migraines, and after they married, Gustav and she moved to Atlantic City because he thought it would be better for her health. Sarah also converted to Christian Science, and although Betty and her family remained Jewish, Betty would often accompany her grandmother Sarah to church when she visited her in Atlantic City. I also asked Betty how her father Sidney met her mother Esther Siff, who lived in Chicago. Betty explained that her father was a traveling salesman, working for a ladies’ lingerie company called Adelson’s. While traveling to Chicago for work, he attended a dance where he met Esther Siff. Sidney and Esther lived in Chicago for the early years of their marriage, and their first two children, Gerald and Betty, were born there. By 1930, however, the family had moved back to Pittsburgh, where their youngest child Elaine was born. 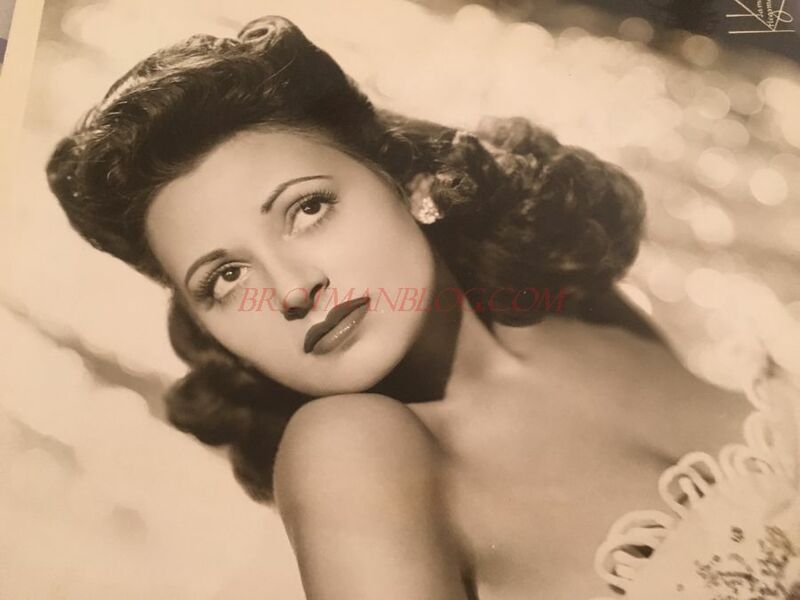 Betty said that her immediate family moved to New York in the 1940s for her father’s job. She had married Julius Jacob by that time, and after spending some time in Massachusetts where Julius was stationed at Fort Devens during the war, they ended up moving to New York where Julius worked for Spear & Company. In 1954 or so, they returned to Pittsburgh, where Julius continued to work for Spear & Company, but the company was not doing well at that point. In 1956, the family moved to Los Angeles where Julius took a job with Broadway Department Stores. Betty’s brother Gerald was already living there at that time as was her aunt Helen and uncle Frank. Sidney and Esther soon followed their children to Los Angeles. Elaine arrived a few years later after her divorce from her first husband, Jerry Kruger. Sadly, Esther Siff Oestreicher/Striker died on her 68th birthday, March 11, 1961. Thus, by the 1960s, all the members of the Oestreicher family were living in the Los Angeles area: the three children of Sarah Stern and Gustav Oestreicher, Sidney, Frank, and Helen, and all of their children, including Sidney’s three children, Gerald, Betty, and Elaine. 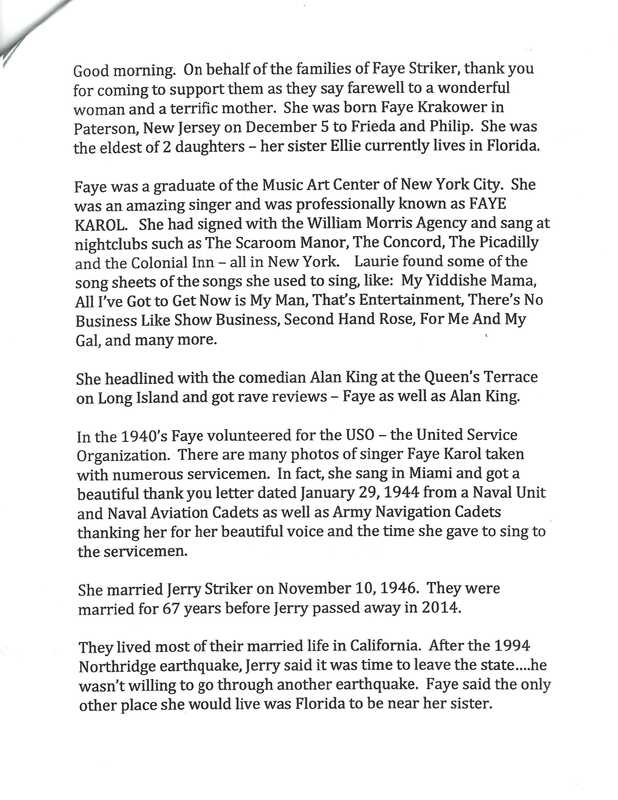 Faye had quite an interesting life as a singer before marrying Gerald in 1946. The following is an excerpt from the eulogy given at her funeral in 2015. Even with all this information, I realized when I got off the phone with Betty that I still had more questions about her childhood and adolescence in Pittsburgh. Did she know the other Schoenthal cousins? What was life like? Were they active in the Jewish community? There were many more things I wanted to discuss with her. I had planned to call Betty and Elaine again after those initial conversations. But then I left for our trip to Colorado and New Mexico, and when I returned, I was distracted by a number of other matters, and I failed to follow up. I recently learned that Betty’s health deteriorated while I was away, and sadly she passed away on July 19, 2016. She had had a good long life with very few health issues, according to her son Ron. And although I know that anyone who lives 97 years has had a remarkable journey, I am kicking myself for not making that second call. Betty had been so excited to share her memories with me, and there were so many more questions to ask and stories to hear. Life is unpredictable, and we can’t assume anything or take anything for granted. May my cousin Betty rest in peace, and may her family find comfort in all their memories. This entry was posted in Genealogy, Pittsburgh, Schoenthal and tagged genealogy, Los Angeles, oestreicher, Pittsburgh, schoenthal by Amy. Bookmark the permalink. ‘May she rest in peace’ I was sad to read Betty passed with out that 2nd conversation but blessed to know you got to connect. The picture with her by the car is priceless! Faye was gorgeous and I could almost hear her singing! Thank you, Sharon. I love that photo also, especially since I live in Massachusetts! And yes, Faye was a stunning woman. May her name be a blessing. But oh so wonderful that you actually got to speak to her!! Thank you, Ellen. I am hoping that she found peace at the end, perhaps in part knowing that her life story would not be forgotten. I think you’re right, Amy – I’m sure she loved knowing that her life story would not be forgotten. I’m so glad you had the opportunity to find her and talk with her. You learned so much in your phone call. While we always want more look how much you gained. I think the photograph of Betty by the car is wonderful. Thank you—you’re right. What if I hadn’t found her until now? What a loss that would have been. Dear Cousin Amy. I am the great grandson of Gustov Oestricher and Sarah Stern who I first met at age 3 or 4 in L.A. Thus, I am also the grandson of Sidnet Oestreicher Striker and Esther Siff; son of Gerald Oestreicher Striker and Faye Krakower Striker. Frank Striker was my great Uncle. Betty Jacob and Elaine Klein Wallace my Aunts. I have pictures going back to the 1800’s, and pictures of Frank Striker in WWI and Gerald Striker in WWII. WOW! I am so thrilled that you found my blog, and I would love to see your photos and documents. I will email you. Wonderfulside effect of your blog – finding more new relatives!! It certainly is! And one I never expected when I started the blog. I also meant to offer my condolences on the loss of your cousin but hit the “Send” link too soon. Amy I love reading the comments your readers post as much as your stories. I was thrilled to see Steven Striker found your blog and left such a wonderful comment. I’m sure Betty enjoyed talking to you as much as you did asking her questions. Dancing the genealogy happy dance! How wonderful that you had the opportunity to speak with Betty and hear her stories! I’m saddened by her passing as I know you are, but happy for that you had that once-in-a-lifetime opportunity. We genealogists too often miss out on those precious moments. And Steven Striker’s comment! Wowie – I’m dancing the genealogy happy dance for/with you – how exciting!!! Thank you, Laura! Yes, I am definitely doing the happy dance. I will posting some of the many photos he shared next week! 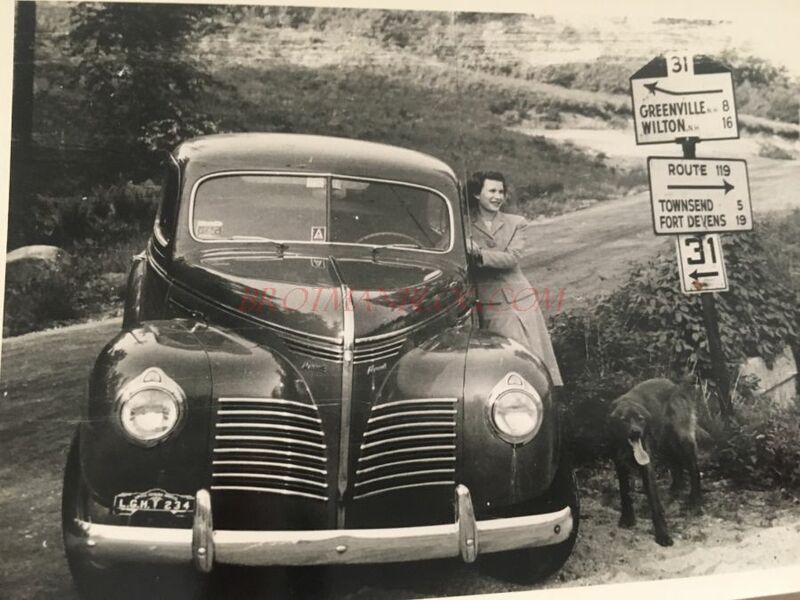 I love the photos, particularly the one with the car, the street sign and the dog !! I hadn’t even noticed the dog! Beautiful photographs and great stories, just two reasons why I am a big fan of your writing and your blog. Thank you, Janice. You make me blush! Thank you—I just am sorry I didn’t get to have another conversation with Betty.